This is a sponsored post on behalf of Kidomi but our love for their learning app is all our own! Looking for learning games that’ll help your kids brush up on their math and reading skills while they play? 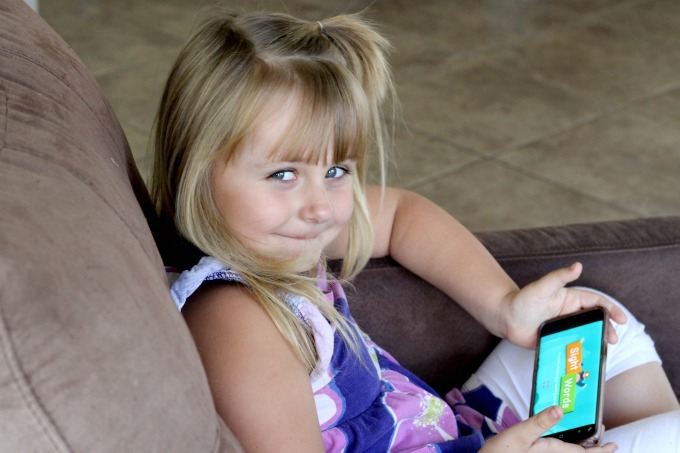 The Kidomi Learning App is our new favorite because it does just that! Moms love it because it’s educational but shhh…don’t tell the kids. They just love it because it’s so much fun! When I recently heard about the Kidomi learning app for kids, I had to check it out. It features dozens of games together in one app, including games from Toca Boca, Highlights For Children, Crayola and Tinybop. I knew it would be perfect for my six year old. She’s constantly on my phone anyway and I’m always looking for ways to steer her away from watching videos. I’d much rather have her interacting with good mommy- approved learning games. I liked that Kidomi comes with a 7 day free trial so we could try it out before buying a subscription. Who wants to pay for something only to find out that their kid doesn’t like it? Signing up was super easy and once I downloaded the app, I realized that wouldn’t be a problem at all. Kidomi was an instant hit! Kidomi is loaded with games that that were perfect for Keira and she was excited to see that some of her favorite characters were part of the fun! There were games with Beauty And The Beast, Elsa, My Little Pony, Caillou Care Bears and Thomas & Friends. That doesn’t even include the games featuring cute animals, super heroes and fun cartoon characters. With Kidomi, we were able to choose games by skill. If your child needs to work on math, there are games that focus on a variety of math skills from sorting, counting, addition and even multiplication. For language arts skills, you’ll find games that teach letter sounds, spelling, sight words and more. Each game also displays the recommended ages to help determine if it’s a good fit. The Sight Words games makes learning sight words fun and these were some of Keira’s favorites! She was able to practice her sight words by popping balloons, playing a memory match game, whacking rodents in Whack-a-mole and more. It even let us add extra words. I made sure to go in an add the ones from her sight word list that had been giving her trouble. These games are so much fun that kids won’t even realize they’re learning! If my daughter is any indication, your kids will want to play them over and over again! Gabby Learns Reading lets kids fill in missing letters or build words from scratch. You choose levels from beginning to hard, though Keira wanted to do them all! This game is my favorite for teaching letter recognition, sounds and spelling. Each time a level is completed, a new one is unlocked. First Grade Learning Games actually consists of a variety of games, with different math and reading skills to choose from. Math games feature everything from patterns to fractions while language arts include spelling and parts of speech. Kids can even play science and geography games. There are even more games that kids can play just for fun. Though they don’t specifically focus on math or language arts, they do help kids learn creativity and hand/eye coordination. 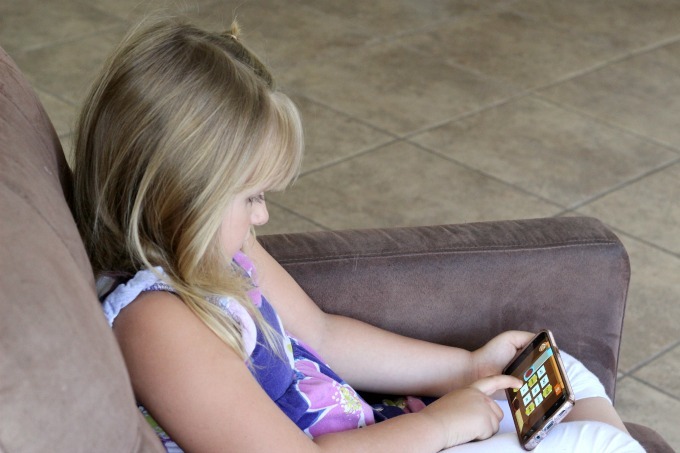 Kidomi allows you to create three profiles with one subscription so if mom’s not around, kids can play on dad’s phone. Parents can choose content, set time limits and even make a playlist of their child’s favorite games. Kidomi is continually adding new games. Personally, I love it because Keira is no longer just watching videos on my phone. 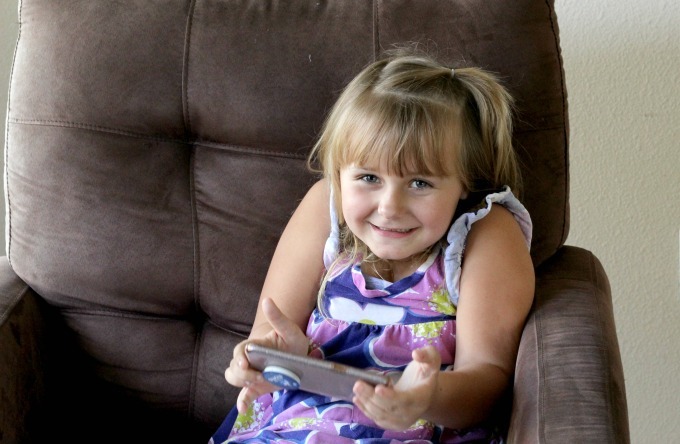 She’s interacting with the app, learning new skills and most of all, having fun! I may never see my phone again! You can download Kidomi now on Google Play, with iOS and web versions to follow. To learn more about the Kidomi learning app, check them out on Facebook, Twitter and Instagram.